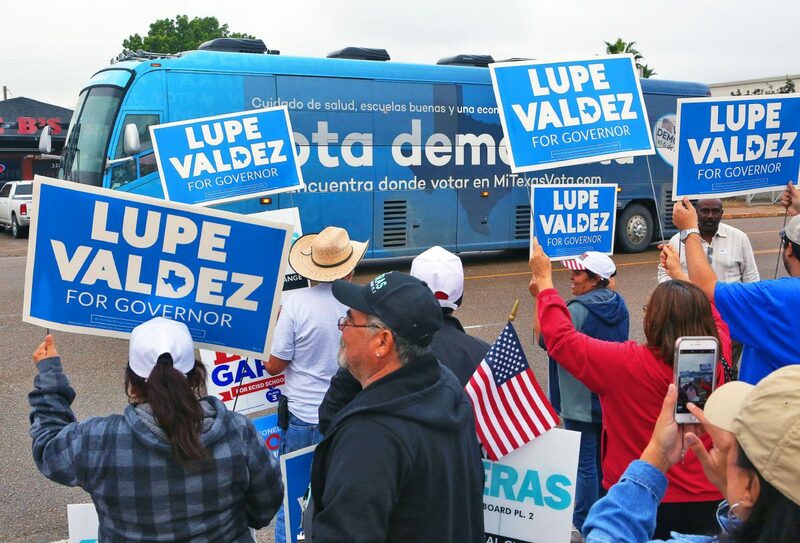 Supporters chant as the bus for Democratic candidate for Texas governor Lupe Valdez drives pasted them before she stops to campaign near an early voting polling place at the Hidalgo county Elections Annex Building on Wednesday, Oct. 24, 2018, in Edinburg. 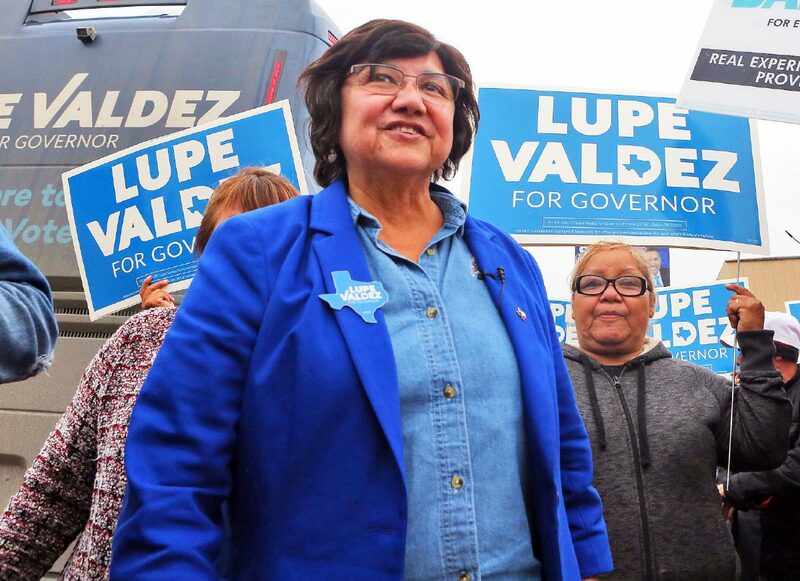 Democratic candidate for Texas governor Lupe Valdez spent Wednesday making campaign stops along the Texas-Mexico border, including three stops in the Rio Grande Valley. Several statewide, local and national Democrats rode on her campaign bus through stops in Eagle Pass, Laredo, Edinburg, Elsa and Harlingen. At the Edinburg campaign stop at the Hidalgo County Election Administration building parking lot, supporters holding signs for Valdez on top of local election signs chanted her name as she exited the bus. The last time Valdez was in the area was in August, at a campaign rally in McAllen with several statewide Democrats, including U.S. Senate candidate Rep. Beto O’Rourke. Wednesday’s event was behind schedule, with Valdez only spending about 30 minutes in Edinburg. If Valdez were to win, she would be the first Latina and openly gay governor of Texas. But unlike the close match between O’Rourke and Cruz, Valdez faces a much steeper challenge, with most polls putting her at least 20 points behind incumbent Gov. Greg Abbott. 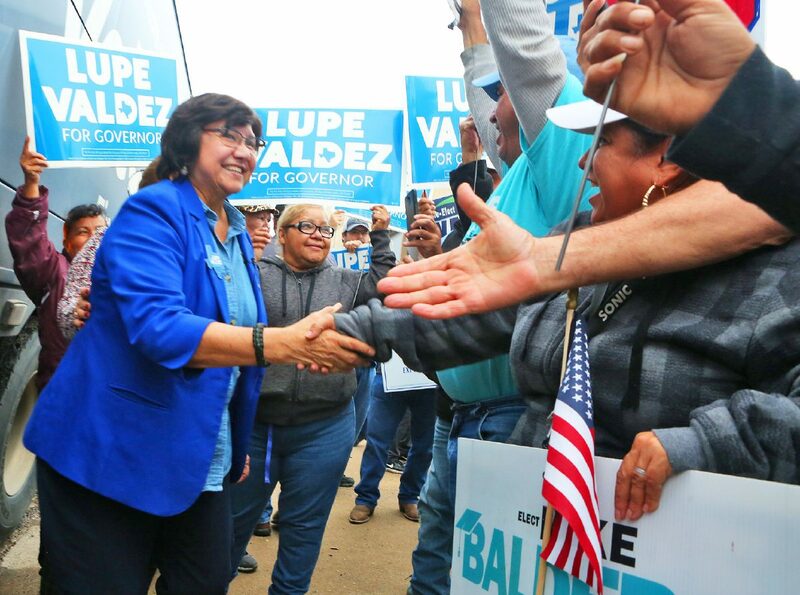 Democratic candidate for Texas governor Lupe Valdez shakes hands with supporters as she campaigns near an early voting polling place at the Hidalgo county Elections Annex Building on Wednesday, Oct. 24, 2018, in Edinburg. Democratic candidate for Texas governor Lupe Valdez campaigns near an early voting polling place at the Hidalgo county Elections Annex Building on Wednesday, Oct. 24, 2018, in Edinburg. 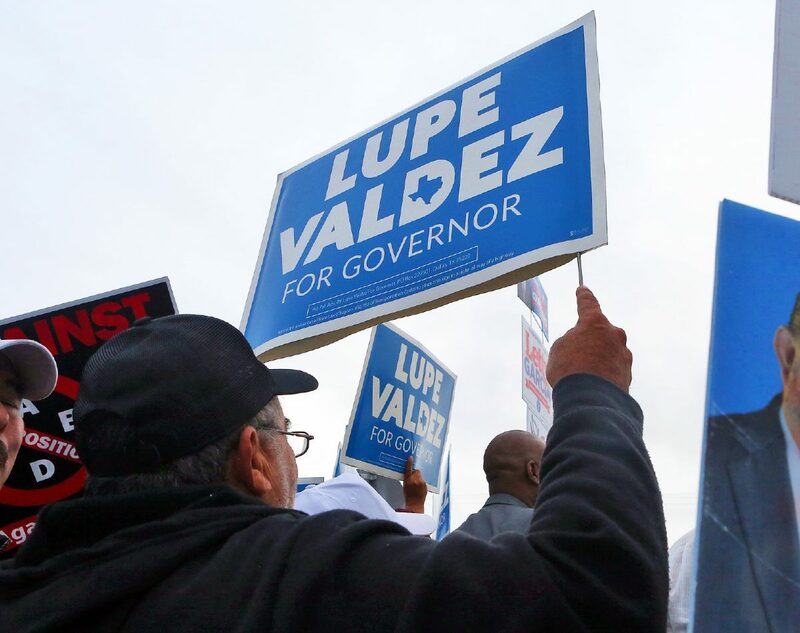 Supporters hold signs for Democratic candidate for Texas governor Lupe Valdez as she campaigns near an early voting polling place at the Hidalgo county Elections Annex Building on Wednesday, Oct. 24, 2018, in Edinburg. 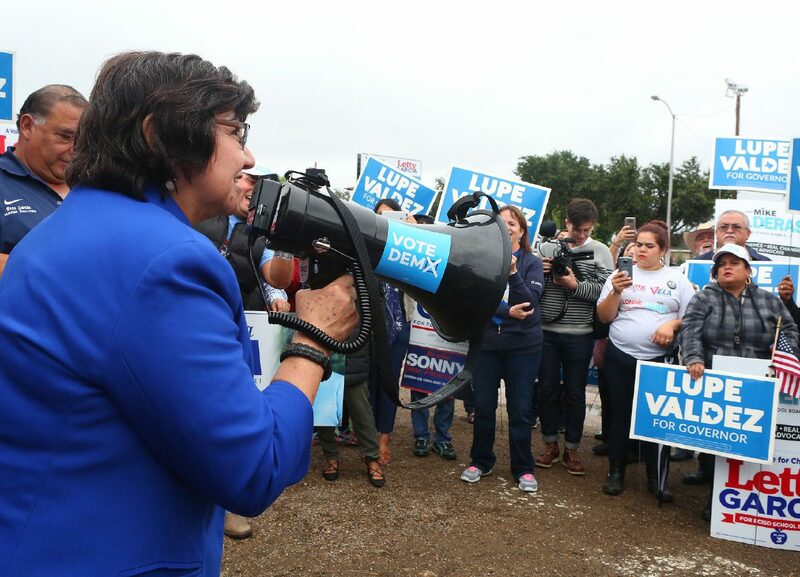 Democratic candidate for Texas governor Lupe Valdez uses a bullhorn as she campaigns near an early voting polling place at the Hidalgo county Elections Annex Building on Wednesday, Oct. 24, 2018, in Edinburg. Nonetheless, Valdez said she’s counting on votes from the border to make it happen. She called Latinos in Texas “a sleeping giant” who will decide this election. Valdez, who is the former Dallas County sheriff, disagrees with Abbott on most key issues, she said. Namely, she would’ve accepted the Medicaid expansion Abbott turned down and change the state’s approach to border security. Jaime Harrison, Democratic National Committee associate chairman, rode on the campaign vehicle with other Democrats and Valdez’ campaign staff. He said the rise in voter turnout throughout Texas is long overdue, and young people need to be the ones to take the lead. This year, Texas has seen a substantial increase in voter registration and early voting. In Hidalgo County, more than twice the number of voters cast ballots on the first day of early voting this year, compared to the midterm election in 2014. According to the Texas Tribune’s Election Tracker, 9.2 percent of registered voters in Hidalgo County voted in the first two days of early voting. Jesus Gutierrez, a retired Edinburg CISD employee, votes in every election, and in every election he votes straight ticket Democrat. On Monday when he cast his ballot on the first day of early voting, as he does most elections, he saw an unusual number of people at the polls. Election Day is Tuesday, Nov. 6. For more information on voting in Hidalgo County, visit: https://www.hidalgocounty.us/105/Elections-Department.